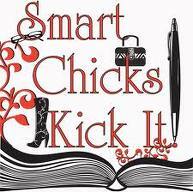 One the Eleventh day of Christmas I'd So Rather Be Reading gave to Mrs. DeRaps a Smart Chicks Kick It signed poster! Remember there will be a winner announced for only one last day! Our gift tomorrow is our Fictional MEN Never Let You Down Tee! I love Smart Chicks! This is going to be great in my classroom...Thanks and Merry Christmas Eve!